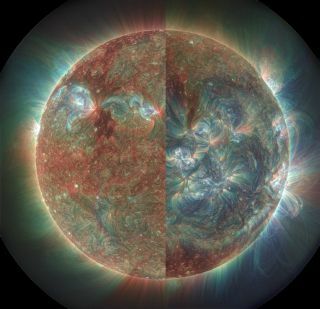 Images captured from Solar Dynamics Observatory's red, green and blue color channels were combined to create this view of the extreme ultraviolet radiation released by the sun's corona layer in May 2010 on the left half of the image, as well as in December 2014 on the right half. Researchers in Wales used the NASA data to examine the outermost layer of the sun's atmosphere known as the solar corona. Studying the solar corona is of great importance for understanding what drives the solar cycle, which is an 11-year period of change the sun experiences. The corona can also tell us how the cycle affects the sun's light and heat output, and how cycle-related changes may affect Earth. The sun's corona, which means "crown" in Latin and Spanish, is made up of plumes of gas and plasma — and temperatures can reach extremes of 3.5 million degrees Fahrenheit (2 million degrees Celsius). Huw Morgan, a researcher at Prifysgol Aberystwyth University in Wales, spent many weeks processing seven years' worth of coronal data. He found that the quiet sun — the parts of the corona that had low activity and no sunspots — experienced surprisingly hot temperatures. The new work was detailed today (July 14) in the journal Science Advances. This image was created by combining 54 observations of the sun's outer atmosphere, called the corona, in 2013. The horizontal bands above and below the equator are "activity belts" that start closer to the poles and gradually move to low latitudes as the 11-year solar cycle progresses. The dark spaces are known as the quiet sun. Past studies of the solar corona have been largely limited to much smaller data sets or particular regions, Morgan told Space.com. This study used data from NASA's Solar Dynamics Observatory (SDO) spanning 2010 to 2017. The tremendous amount of information that contributed to Morgan's findings was collected from SDO instruments such as the Helioseismic and Magnetic Imager (HMI), the Extreme Ultraviolet Variability Experiment (EVE) and the Atmospheric Imaging Assembly (AIA). "During the solar cycle, there's more activity, and we have more sunspots — and that's no surprise," Morgan told Space.com. "That's been known for decades. But for me, it's what's happening in what we call the quiet sun … that was interesting as well." Prominences, solar flares and sunspots excel in the solar popularity contest; the attention-grabbing images that the SDO features of those solar events are certainly an indication of large public and scientific interest in them. These features are most common during the peak stage of solar maximum of the sun's 11-year cycle of change. The new findings indicate that there is also plenty to learn by studying the relatively calmer periods, known as the solar minimum. "The active regions, the sunspots, get a lot of attention," Morgan said. "But in fact, they're only a small area of the whole sun." According to the study, looking at the quiet-sun area of the corona allows scientists to understand more about the outermost layer of the star, which, in turn, can help them better grasp other important phenomena. For instance, a clearer understanding of how the quiet sun changes over time and across the star's surface will give scientists insight into what kind of light or heat output Earth will receive over a solar cycle. This matters for many reasons, one of which is that an excess of ultraviolet exposure on human skin, for instance, can cause cellular damage. This image shows the solar corona's temperature and emission measure (EM) in January 2011. It is an analysis of extreme ultraviolet waves from the Atmospheric Imaging Assembly on the Solar Dynamic Observatory. To gain a clearer picture of what was going on, Morgan looked at data from three different instruments on the SDO. "We are actually looking at a lot of layers at the same time, and they may be at different temperatures, so it is not as simple as being able to hold some instrument up and get one temperature," he said. "What we do, in fact, is look at lots of different wavelengths and use this information to try to estimate the distribution of temperatures we are looking at. So, it could be quite a wide [range]: You could have plasma at a million degrees [Celsius], and also, along the same line, you could have plasma at 2 million degrees [Celsius]." This type of measurement is known as the differential emission measure. By estimating how the plasma in the corona is distributed, scientists can get a big-picture view of the sun's dynamics and their consequences. In the future, Morgan hopes researchers will probe the quiet sun's temperature distributions in more detail, to learn what else the less-active regions can reveal about the nature of the sun.